Anyhow, a couple of days later, some of us tried out a new restaurant in Philadelphia, The Love — which was pretty good — and on their check-out table they had postcards (really — postcards?) 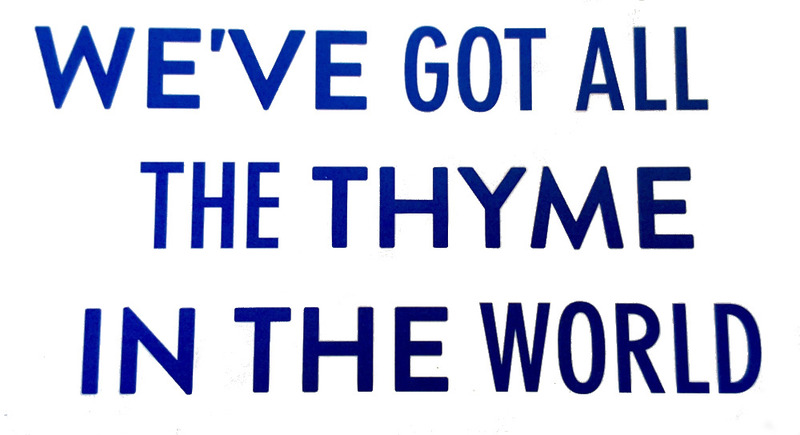 featuring in bright blue text "WE'VE GOT ALL THE THYME IN THE WORLD". This study examines co-referential repetitions in task-oriented dialogue for characteristics conducive to the lowered clarity of words naming Given entities. Pairs of word tokens repeatedly mentioning the same entity within a single task-oriented dialogue (n=294) and pairs introducing an entity in separate dialogues (n=48) were compared. In both samples intelligibility and length fell significantly with repeated mention. Deaccented second mentions, thought to be largely responsible for this effect, were rare (15% within, 6% between dialogues) and did not account for effects of repetition. Repetitions within sentences of the same structure are thought to encourage deaccenting, but were not common (6%, 35%), and structural similarity did not encourage deaccenting. Similarity in the conversational role of carrier utterances was associated with higher rates of similar structure among re-introductions, but not with increased frequency of deaccenting. Thus, factors which should promote marking of Givenness are either lacking or ineffective. If speakers articulate clearly enough to meet the perceptual needs of their listeners, clarity should depend on what listeners know about (listener-Given) rather than on what speakers know about (speaker-Given). For words excerpted from spontaneous speech, however, intelligibility to naive adult listeners showed only effects of the speaker’s knowledge. Words introducing labeled map landmarks to two successive listeners were less clear on repetition even though the second listener had not heard the original mention (Experiment 1). Repeated mentions became less clear even after the listener reported inability to see the landmark (Experiment 2). Speakers were affected by what they had heard listeners mention: Intelligibility fell equally in coreferential repetitions across and within speakers (Experiment 3), whether or not the repeater could see the referent (Experiment 4). The results are explained via fast priming processes dependent on the speaker’s knowledge and slow, optional processes drawing inferences about the listener’s. One conclusion seems to be that frequency and recency effects, though generally a help to efficient communication, are less controlled by "audience design" than one might think, and more influenced by the speaker's own history. ‘Time and thyme are not homophones’, a 2008 article by Susanne Gahl published in Language, reports a frequency effect differentiating the durations of homophones, for example, time vs. thyme. The article is of fundamental theoretical relevance, as the finding reported has significant implications for research on homophones and the effects of frequency in general. As I show in the present paper, however, the main analysis in Gahl 2008 does not provide quantitative evidence for the effect. The same is true of a follow-up study (Gahl 2009). I provide here a reanalysis based on the original data set, which shows that the frequency effect reported in the original article is real. This paper has demonstrated that the main analyses in Gahl 2008, 2009, although widely cited as doing so, do not provide explicit evidence for a durational difference between homophones that is contingent on differences in frequency. A reanalysis of the data Gahl collected, however, does provide evidence for this effect. In conclusion, the theoretical implications regarding the lexical representation of homophones, extensively discussed in Gahl 2008 and numerous papers citing it, still stand. Furthermore, the same reanalysis carried out on a sample of homographic noun-verb conversion homophones provides further evidence for the lemma-frequency effect, a finding discussed in detail in Lohmann 2017. The latter result suggests that the frequency effect on homophone duration is not contingent on differences in spelling. This makes me think of human PA announcements (e.g. on public transport, or in supermarkets, etc.) that become so routine for the driver (etc.) that a "naive" listener has zero chance of understanding the first repetition. Let’s not forget that Mussolini made the trains run on thyme. Lohmann is saying that Gahl's original data/the Switchboard corpus does support the 2008 paper's 'finding'. But that the original finding was not correctly founded on the data? Is Lohmann saying that Gahl's use of statistics/correlation was invalid? Perhaps there's not as high a degree of correlation as claimed? If Gahl was wrong, I don't understand why; and I don't understand what difference it makes. My takeaway is there's no such thing as a genuine homophone. [(myl) That's true and not true. On the "not true" side, the first thing to keep in mind is that these differences in duration are facts about distributions of measurements that are also affected by a very large number of other factors, like phrasal position, overall speaking rate, individual speaker characteristics, and so on; so the ability to select e.g. 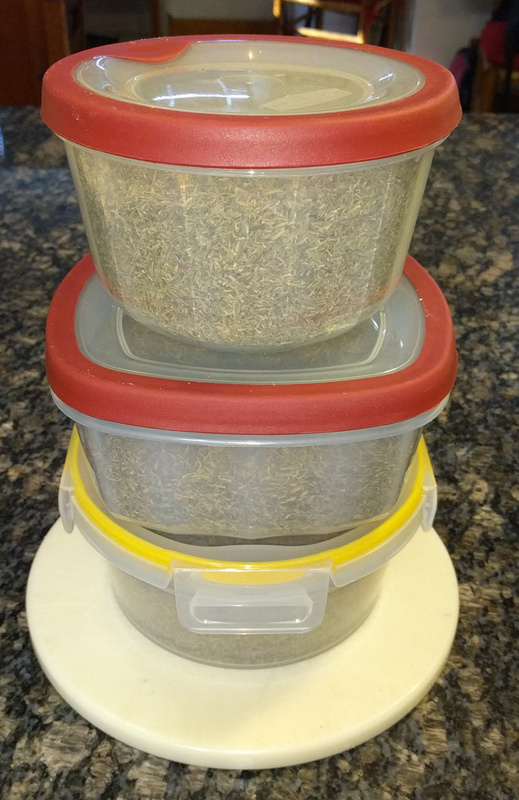 thyme vs. time on the basis of a single production is negligible. And though none of these papers test it, I'd also predict that there would be no reliable differences in the production of isolated citation forms. So it remains valid to say that the claims that a word makes on sound are encoded in its (discrete, digital) phonological representation, and that "homophones" have the same phonological representations. The "all the thyme in the world" bit makes me wonder if there would be any scholarly benefit other than sheer amusement in compiling a list of the X most common fixed-phrases/idioms/cliches including the word "time" and seeing how many of them also exist out there on the internet with "thyme" swapped in. I am pleased to discover that the cultural influence of the Chambers Brothers is still strong enough that googling reveals multiple instances of "thyme has come today." "Apparently the 16-oz. package is meant for people who use it to make tea." So, that would be for tea-thyme then? I was delighted to see that a search for "ain't nobody got thyme for that" triggered a suggestion from Google that "ain't nobody got thyme for that cross stitch" is a big hit. @J. W. Brewer: If we're going to stick to amusement value, as a gardener and a musician, I am pleased to note that my garden contains, among other things, 4/4 (i.e., common thyme), but when I harvest it for kitchen use it becomes 2/2 (cut time). Oh, and when I weed in its vicinity, I will often discover that I have thyme on my hands. So you'll tell your next house guests 'Take all the thyme you need'? To everything there is a seasoning, and a thyme for every purpose under heaven. But is yours a thyme to love, or a thyme to hate? 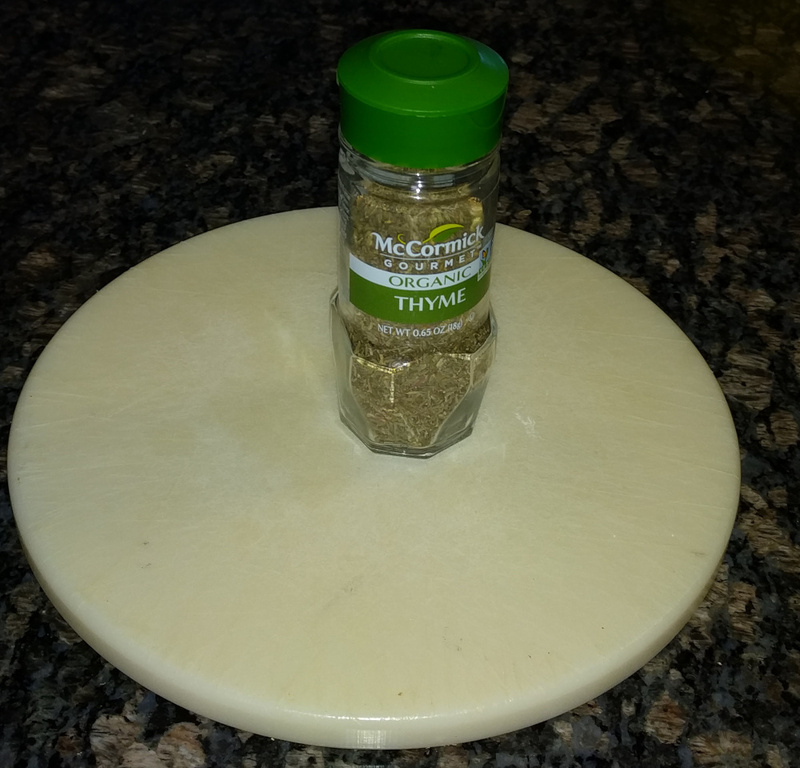 A thyme to keep, or a thyme to cast away? Or Lebanese like my wife (and other middle easterners). Mix it with sesame seeds, sumac, and olive oil to make a spread called zaatar, which is the Arabic word for thyme (but not time). To everything there is a seasoning, and a thyme for every purpose under heaven. More than merely "ingenious", I would say. I'm still smiling after reading it, and thinking that this thread has surely demonstrated that there is a thyme to every purpose under Heaven. [(myl) Also perhaps that Eternity is in love with the productions of Thyme. Let's not forget Nero Wolfe and his wild thyme honey. So if I were to measure the length of various utterances of "Mondegreen", would I be an eggcorn-thymer ? > In both samples intelligibility and length fell significantly with repeated mention. The duet "Bide Thy Thyme," from P. D. Q. Bach's oratorio "The Seasonings," comes to mind. Fortunately for the piece, but unfortunately for the linguistic question, any thyme/time distinction is lost because the music sets the pace. If you were in the club house on the golf course, it would be thyme-tea tea thyme tee thyme.